A tasty Thanksgiving dessert that tastes as good as it looks! Add the pumpkin puree, brown sugar, cinnamon, pumpkin pie spice, and heavy cream. Mix it all together and set aside. Beat the egg whites on a medium to high setting until they form soft peaks. Continue beating, gradually adding the sugar, until the whites form stiff peaks. The mixture will become smooth and gain volume. Set aside. In a separate bowl, mix the vanilla extract into the cream cheese until smooth. In a third bowl, microwave the mini marshmallows for approx. 30 seconds. Add the melted marshmallows to the cream cheese mixture and stir until combined. Gradually add small amounts of the egg white mixture and fold carefully until the mixture is combined and all the egg whites have been added. Refrigerate this mixture for around 60 minutes. 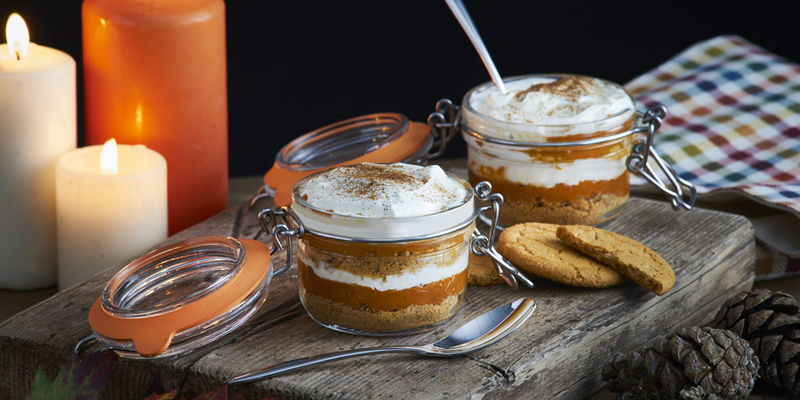 At the bottom of your Kilner® 4fl oz Clip Top Jars, add around 1 ½ - 2 tablespoons of the crushed gingersnap cookies. Add 2 tablespoons of pumpkin filling. Add 2 tablespoons of cream cheese mousse. Repeat steps 1-3 once more. To finish, top the jars with helping of whipped cream, a drizzle of caramel sauce, and a sprinkle of cookie crumbs if desired.